So after flying round some munros last Saturday I was looking for another round that was more of a steady pace but with good ascent and distance. The weather for Saturday looked poor for walking so I spent my time paddling in the sea of Elie and decided on doing the Northern Glen Lockay munros and Ben Challum on the Sunday. So, believe it or not, After 4 hours sleep I was up and eating breaky at 0410. Out the door by 0440 and I arrived at the car parking area at 0620. I parked up the winding road from Kenknock farm at NN461369. Suited and booted and walking up the tarmac track at 0628. Its a 3km walk up the track but it is a gentle ascent climbing 150m as you go. There is a huge pylon here and that signals the end of walking on any kind of path as I head of at right angles to the tarmac and onto the virgin terrain. (No jokes please). The first Munro, Beinn Heasgarnich, is approx 4km West of here but it is over a boggy peat land which hillocks and mounds in abundance and it would be easy to get lost in the mist and you were not paying attention. I headed SWW for 2km to the Northern edge of the small ridge, Creag na h-Achlarich, trying to keep to high ground where possible. I stopped just on top of the small ridge and looked back at an amasingly boggy wetland I had just crossed. Surprisingly, although wet, my feet did not seem too wet at all considering the state of the ground. I then headed for 1km to Coire Ban Mor again trying to keep high and then straight up the easy slope to the summit of Beainn Heasgarnich. One hour and fifty minutes and feeling good. I am shrouded in mist with very few views. So I head of due South heading for the summit of Stob an Fhir Bhogha which I reach after 1km and then West down the front of Sron Tairbh. As I start to descend I come out of the mist and can clearly see the Beallach down below. 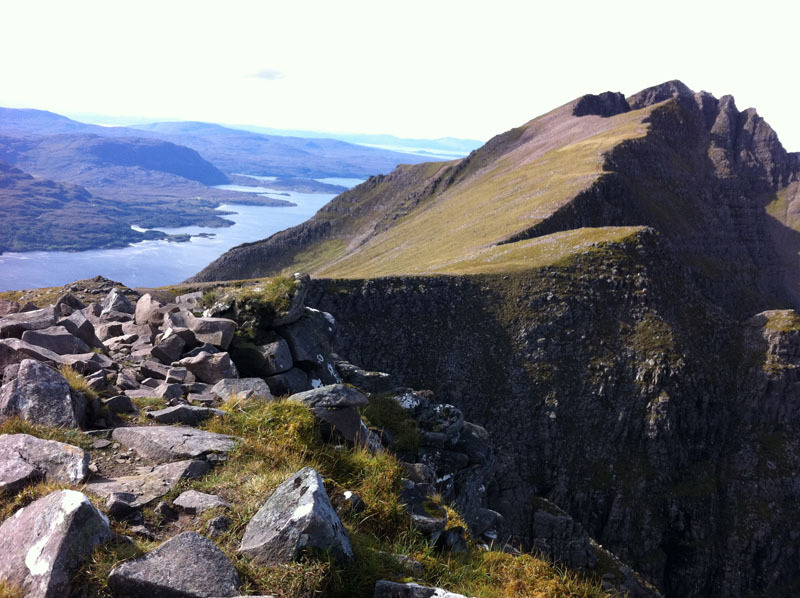 I want to loose as little height as possible so I head for what looks like the highest point on the Beallach. Its an easy enough descent although quite steep in places. I can see Creag Mhor directly in front of me and a direct assault looks challenging. When I planned this route I was not sure if I was going to do a direct assault up the steep slopes and crags or bypass them to the west as an easier alternative. However bearing in mind I was going to do Ben Challum, and it is a steep ascent, and my penchant for cramp when I over excert myself I decided to do a slight bypass. It was easy enough to identify a route up the grassy slopes to the North of the crags and this is the route I choose. In no time at all I was on my second summit. My detour only added 0.5km to the direct ascent but was probably noticeable less taxing on this old body. Ok, now I have to navigate to the Corbett. The route I had planned follows the boundary line but where are the rusty old fence posts when you need them. It was now a matter of heading West for 1kmkeeping to the ridge/edges of the coire then heading South past the summit of Stob nan Clach heading for the Beallach at Lairig Mhic Bhaidein. I could quite easily see the summit ridge of Cam Chreag up ahead and it looked quite impressive. It also looked quite steep but I could clearly see the route up through the grassy bouldery terrain which I was going to take. So onwards and upwards to the ridgeline and then a stroll, up and down to the corbett summit. Geez, someone needs to get a digger up here and level this thing. Its hillier than a big hilly thing. Its now 4 and a half hours from the start. A bit of dejavue here. I had tried to do Ben Challum after the Southern Munros and corbet early this year. I had arrived at the Southern Corbett in a similar time but got severe cramp on Ben Challum and had to walk out. Fingers crossed it won’t happen again. So, I now head SEE up and down over the hillocks for half a km and then start to descend slightly as I traverse across to Glas Leathad, cutting out part of the ridge and then down the steep slope to the Beallach Glas Leathad. At this point I find the rusty fence and poles which aid me greatly on my descent and then climb up Ben challum. The descent is very steep in places and a slight twinge of cramp appears in my left thigh. Oh no. Thankfully it went away as I reached the Beallach and I now only had 450m of steep ascent to Ben Challum summit to complete hahaha. Not to mention the walk out. I looked up disheartingly as I saw how steep it was and there looked to be crags blocking the way. Ach its only 450m, a dawddle. So onwards and upwards I climb. I traverse slightly left and right just to try to make the ascent easier as I pretty much follow the fence posts all the way. After about 200m I come across some big slabs and they are wet. I stop for a minute and think about the descent never mind the climb. How am I going to get back down. Can’t be worrying about that at the moment because I have to summit. So I climb up the slab with the fence post sticking in it and make my way upwards. 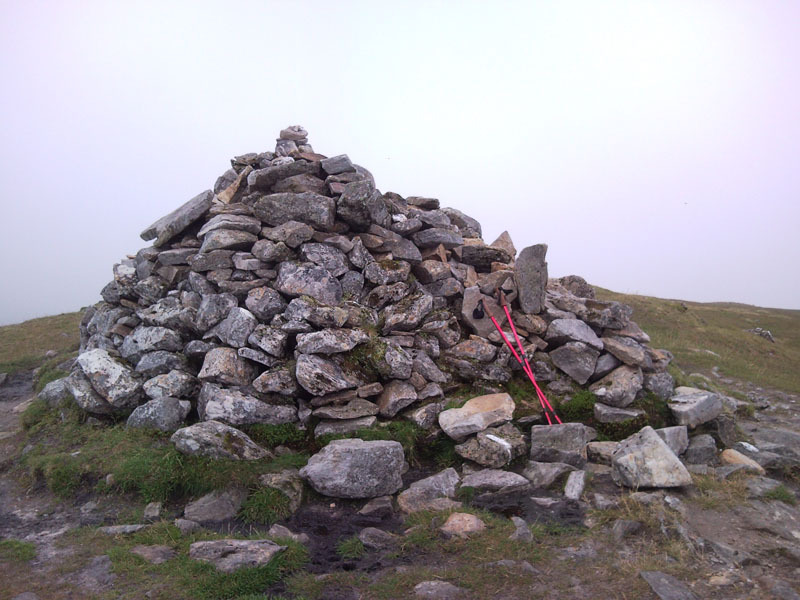 After what seemed like ages I finally see the huge cairn on the summit. I am hoping its in the form of a shelter like Glas Maol so I can sink into its comforting arms and take some time out to replenish my resources. Not that its raining or the weather is bad because neither of those are true although there is a heavy mist. However its just a big lump of rocks. So I crash down shut my eyes and dream I am on a beach somewhere. After refreshments its now time to go. I look in the direction I came and the mist has just descended blocking my path. There are three options. 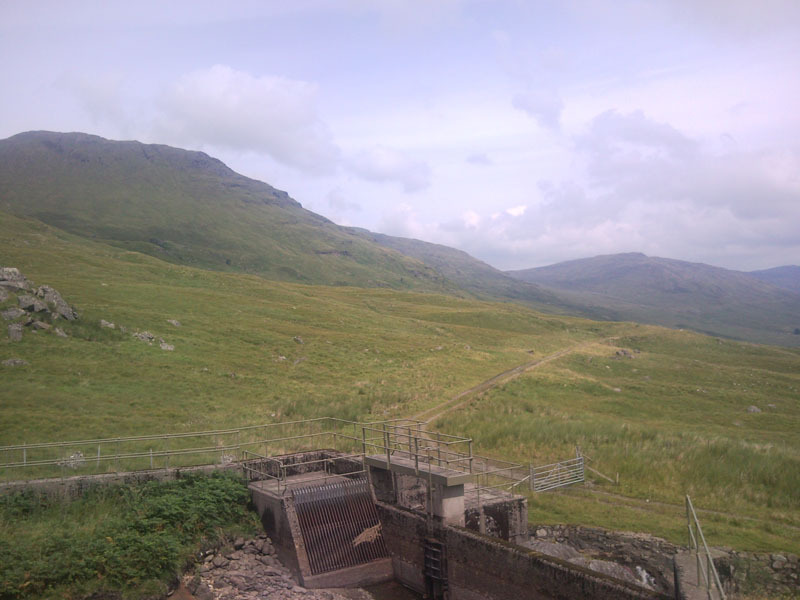 Two of which I need to choose one and the third being the tourist path to Strath Fillan. I am sure there must be a path going that way but as I said earlier this journey has been virtually pathless. So Option one is go back the way I came and descend 450m to the Beallach from there it is and easy descend to the path for the walk out. 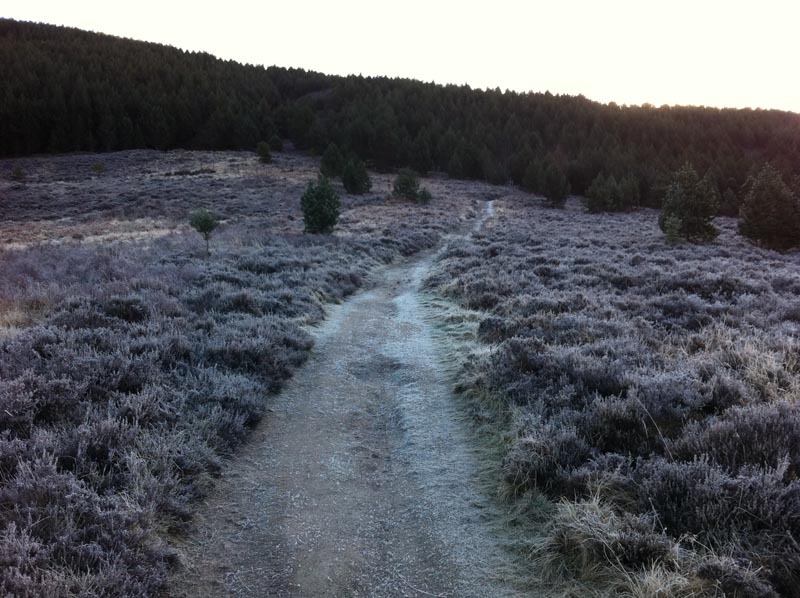 The second option is to head East for 1km then descend down the craggy hillside to get to the path. Since I can’t vouch for the terrain I decide on going back the way I came. I head down the ridge and pick up the fence posts and descend the slabs and rocks and hillside back to the Beallach which was actually much easier than I had feared. Its now an easy 2.5km to the Path heading down the pathless boggy grassy side of Allt Challum and then 8.5km of undulating track back to the car. The last couple of kms were shear hell. Boy was I glad to see the car. Unsurprisingly I saw no one on the hills today. However as I was driving out a lad passed me in walking gear so he has been up there somewhere and there were a lot of cars near Kenknock farm.